The Nature's Mystics teeth whitening pen has advanced gel that whitens BETTER and with LESS sensitivity than competing brands. The Nature's Mystics Teeth Whitening Pen is a safe, effective and quick way to achieve bright, white teeth. The Nature's Mystics pens contain the strongest gel available for home use (35% Carbamide Peroxide), and are made in the USA. High quality peroxide freshens breath, kills bacteria, and restores teeth to their natural white hue. No unpleasant taste or sensitivity. Toss one in every bag to whiten on the go, Also it's the perfect way to touch up after a cup of coffee or when you're out on a date. Teeth get whiter with each application. It's perfect for touch-ups and on-the-go whitening. Natural Ingredients Include; Sodium Bicarbonate, Chamomile, Aloe Vera, and Pomegranate extract to get your teeth to their natural whiteness. Use Once a Day until you receive satisfied results. For best results continue use for 2 weeks uninterrupted. 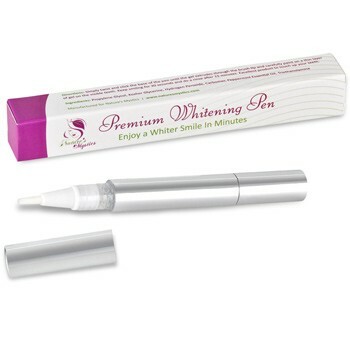 Each pen lasts for approximately 30 days of whitening applications. Do not eat or drink anything except water for 30 minutes. Keep your whitening pen in a cool dry place. Clinically proven to be safe, easy, and effective, it fits into even the busiest lifestyles. Nature's Mystics All Natural teeth whitening Pen. M. Mangum Review by This product is GREAT!! !